A hearing aid screening is a painless test your audiologist will perform to determine if you have a hearing loss. Typically, you will be asked to sit in a sound both and respond to sounds. If you pass your hearing screening, your hearing is good and you do not need to do anything else. We will invite you back for a hearing screening each year to check for changes in your hearing. 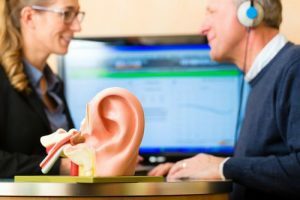 If you are found to have a hearing loss, your audiologist will explain the options available to you and give you the opportunity to try hearing aids and hear the difference they could make for you. We recommend you bring a close friend or relative with you to your hearing aid consultation. Research consistently shows that you have a higher likelihood of successfully addressing your hearing loss when you bring a wife, husband, daughter, son, or close friend into the hearing screening with you. Call Us Today to Schedule Your Hearing Aid Consult! Have questions or are ready to get your hearing tested now? Call us at 727-304-6786 to schedule your hearing aid consult at the Hearing Center at Ear, Nose and Throat Associates.